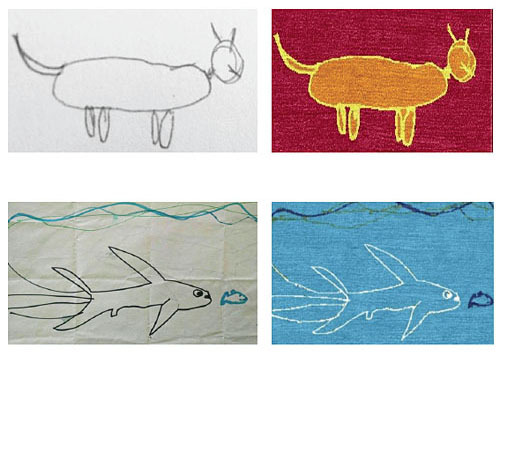 Take any personal drawing or sketch and transform it into an original, one-of-a-kind, hand-made rug. 100 knot hand-tufted; dyed with vegetable dyes. The inspiration for 4Favorites began at a Colorado home while the owner and designer was going through boxes of her children's artwork, prints, and homework... childhood! Touching and feeling the memories of her son and daughter continues to this day to bring her joy and a sense of pride. Some of the drawings were framed and hung on walls; some were just in boxes that gathered dust. The priceless childhood artifacts continued to cloud our designer's mental and physical space until she had the inspiration to bring them into our present day lives. It was from viewing her own children's responses to their personal artwork, that she realized she could combine her children's world into her own. We take any personal drawing, sketch, map, and transform it into an original, one-of-a-kind, custom rug for walls, floors, or even ceilings. The process takes approximately 8 weeks to complete from the time you send in your child’s artwork. When you order a 4Favorites rug, you are ordering an original work of art. Your rug will maintain its beauty for years and yearsgenerations and generations. Each rug is made once, and only for you. Your design will not be made by a machine, but by the hands of experienced adult Nepalese and Tibetan weavers. Your design will never be copied. In addition, your rug will be certified through Goodweave, an international organization committed to ending child labor in the rug business. Goodweave performs unannounced on-site inspections of looms all over the world in to ensure that no children are working illegally. Your original design will be woven into an extremely high quality wool rug. It will be a one-of-a-kind rug that will be made once, and only for you. Sheep grazing at high elevation on the Tibetan plateau produce wool that has a higher lanolin content and is very strong and lustrous. These qualities make it particularly resistant to spills and staining. The wool is shorn by hand, and then prepared for the next step, washing. Harsh chemicals are unnecessary, so we don’t use any! 4Favorites also offers the opportunity to purchase carbon offsets. The process from beginning to end takes 6-8 weeks. We use organic cotton warp thread, locally sourced raw materials and adult labor. We're committed to our wool, our weavers, and our production process!